It has been suggested to me by some good friends and mentors that I ought to schedule time each week to have what is apparently called a “day off.” This is necessary to avoid burnout, re-charge the batteries, etc etc. I totally get it. I’m just not very good at it. I have a hard time with the concept. I was raised in a household where weekends are for cleaning, yard work, cooking, volunteering, and well, working, in an unpaid sort of way. But, I don’t want to burn out, and I do need some down time, so I’m trying. It’s Sunday afternoon and I spent the morning doing workish stuff- taught a class, brushed and trimmed Stanley’s ridiculously long fur (an epic battle worthy of its own entry), did some laundry, and thought, now what? Naturally, my mind turned to cookies, as it so often does. Baking is such a pleasant way to spend an hour, and eating cookies no less so. Thrusting aside my weight-loss plans, I hustled to the kitchen! 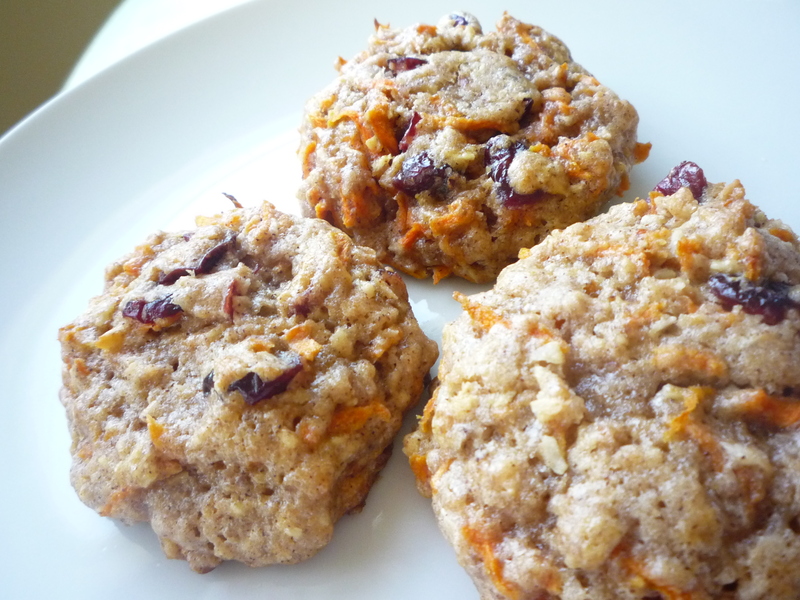 The cookies of choice today were these Carrot Raisin Cookies- a super-awesome, mostly healthy-ish cookie from one of my new favorite cookbooks- Vegan Cookies Invade Your Cookie Jar by Isa Chandra Moskowitz and Terry Hope Romero. I made these cookies just last week and they were much loved by my 7 AM students (I am not above bribery) and friends. Why make them again a mere week later? One of my students gave me some nice organic carrots (I think she shares my views on bribery). Also- I’ve found that cookies are great to freeze. Cool, wrap individually in foil, and put in a freezer bag for a portion-controlled snack. 10-15 secs in the microwave and you’re in homemade cookie heaven. Okay: I’ve veered off a bit from the authors’ original recipe (which included orange zest), but the Laurasana version appears below. Do try them, they’re soft, moist, spicy, and quite comforting. Lovely with a cup of tea, and even as a healthy snack an hour or two before you practice. 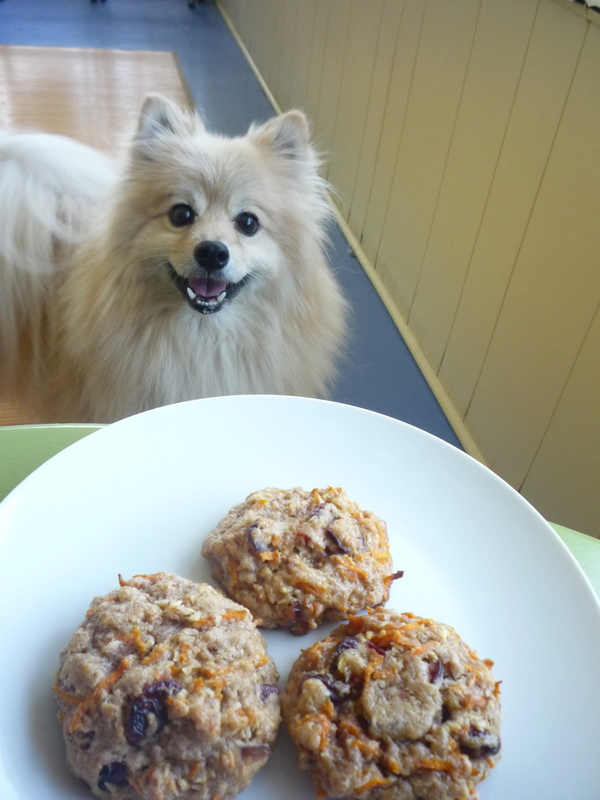 Oh, and don’t worry- Stan and Mo don’t get to eat my cookies when there are raisins in them. Or if I don’t feel like sharing. But as you can see, Stan’s optimistic. Hi, I’m Stanley, and I approve these cookies. 1. Preheat oven to 350 degrees. Generously grease two baking sheets or line with parchment paper or silicone liner. 2. In large bowl, beat together nondairy milk, ground flax seeds, oil, brown sugar, sugar, & vanilla. 3. In a separate bowl, sift together flour, baking powder, cinnamon, ginger, nutmeg & salt. 4. Add dry ingredients to wet ingredients but do not overmix. Finally, fold in coconut, walnuts (if using), and raisins. Dough will be sticky and moist. 5. Drop generous tablespoons of dough onto cookie sheets, leaving about 2 inches of space between each. 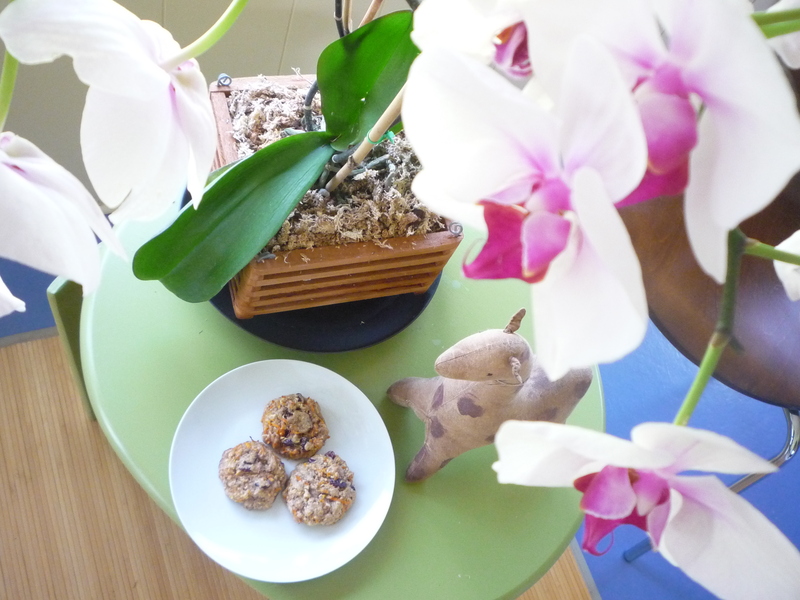 For more round, pretty cookies, moisten hands with water and gently form into balls instead of dropping. Bake for 14-16 minutes until edges are brown and tops are firm. Let the cookies rest on the baking sheet for 10 minutes and then transfer to wire racks. Yield- somewhere in the neighborhood of 2 dozen cookies, depending on how much dough you eat. No raw eggs, it’s all good! Notes: you can vary the spices as you like. Sometimes I grate fresh ginger instead of using powdered, or add cardamom or cloves. If you’re not a coconut fan, don’t panic- it really doesn’t taste of coconut. If I were to leave out the coconut I’d probably sub oatmeal to arrive at a similar texture. The final product- such a nice way to spend Sunday afternoon.